At Copperloy, we have been engineering high quality products for over 60 years that increase the productivity, efficiency and profitability for our businesses clients throughout multiple sectors. One area of focus for us has been creating 4 different types of lift tables; each having their own set of core benefits. Among the benefits of a Copperloy’s Hydraulic Lift Tables are their durability, convenience and versatility. But most importantly, they are specially designed and engineered to eliminate undue stress and strain on workers. With these enhanced safety features and the ease of use associated with the scissor lift table models, hydraulic lift tables reduce the risk of injuries. This enables employees to increase productivity while keeping safe and healthy in the process. Hydraulic lift tables also have the added benefit of accommodating capacities ranging from 2,500 to 25,000 lbs, with a vertical lift of 24”, 36” or 48” for 2,500 to 6,000 lb. tables and a vertical lift of 24”, 48” and 60” for 8,000 to 25,000 lb. tables. Different industries have unique requirements that are specific to their sector, business specialty and even their individual facility needs when it comes to equipment and lift table specifications. At Copperloy, our ergonomic lift tables have the benefit of providing the perfect solution that meets the needs of multiple industries, businesses and facilities. Offering supreme safety specs, our ergonomic lift and tilt tables and ergonomic scissor lift table options are among the most efficient material handling options available today. Capacities for our ergonomic lift tables range between 2,000 and 10,000 lbs. and offer a vertical travel of 24″, 36″ or 48″ with a lowered height of 15″. Also available, are lift tables in 30º, 45º and 60º of tilt and 90º on our Up-Ender tables. Standard ergonomic scissor lift table platform sizes range from 24″ x 36″ to 48″ x 64”. Our Copperloy Low-Entry Lift Table lineup offers improved efficiency, productivity and enhanced safety options, eliminating undue stress on workers and minimizing risk of injury. This solves a major concern for businesses in every industry sector today as safety and efficiency is the key to business success. Low-entry lift tables improve efficiency and increase productivity, showcasing a line up that has a net capacity ranging from 2,500 to 6,000 lbs. and a vertical travel of 33″, 48″ and 60″. 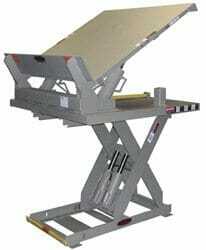 Low-entry hydraulic scissor lift tables also provide easy on/off loading and unloading. With the capacity to lower as much as 3/8″ from floor level; the need for ramps, pits and forklifts is eliminated. Standard sizes for low entry lift tables range from 40″ x 48″ to 76″ x 55″. The Copperloy Double-Long Lift Tables make lifting and feeding hard to handle, long, heavy loads safer and easier. Double-long lift tables provide an excellent solution for bundling or banding materials, such as pipe, bar stock or lumber and are adjustable for high and low entry. As with all Copperloy lift table options, we have made it a priority to provide the absolute best solutions for improved worker safety, increased productivity and overall work efficiency. Copperloy offers most standard size solutions and as always, we invite you to contact our factory anytime to discuss any custom requirements you may have, by calling us at (800) 321-4968. We look forward to speaking with you. Lift tables can work wonders for loading docks, material handling facilities, and other operations across a wide range of industries and potential usages. Of course, not all scissor lift tables are created equal. What should you be looking for, and what really makes a heavy duty lift table you can trust to perform? When you think about a heavy duty lift table, the first factor that likely comes to mind is how much of a load or capacity it can handle. With capacities of up to 25,000 lbs, the hydraulic lift tables from Copperloy are more than sturdy enough to meet any need and tackle any job. It’s also important to have a machine that can work with your facility and other equipment or gear. That’s why we produce vertical lift ranges in a variety of specifications, from 24 inches up to 60 inches. Platform sizes range from 24 x 36 inches, to 48 x 96 inches, to handle loads of all shapes and sizes. We have a custom fabrication team, with an in-house engineering team that can create custom lift tables for any need in any plant or material handling situation. Hydraulic lift tables should certainly be easy to operate. That’s why handheld push buttons and foot pedals are both available, and 460-volt, three-phase, two-horsepower motors provide rugged durability and dependability. Safety features are also key when dealing with heavy loads, machinery and equipment of all kinds. From safety bars and side rails to accordion skirts, toe guards and more, our scissor lift tables are designed to entirely minimize safety concerns and the risk of injuries. Our lift tables feature DU bearings lubricated for life, while captured rollers ensure the lift table won’t upend, and pressure-compensated flow controls provide even, smooth descents and prevent free falls. Special lift table options from Copplerloy include ergonomic and tilt tables, low-entry tables and double-long tables as well, always ensuring you have the right gear to match your needs. Watch our lift tables in action, there is a reason they are the best! With high quality, heavy duty hydraulic lift tables, you’ll receive a range of benefits. You’ll be able to reduce physical strain and injury for your employees, while also increasing their output and productivity, and improving all-around safety conditions. Your operation will become more efficient, effective and capable, and you’ll be able to get more done in less time. Scissor lift tables can provide you with many advantages, just be sure to make the right choice when you’re ready to make a purchase. For heavy duty functionality and all of the features you’ve been seeking, Copperloy hydraulic lift tables will exceed your expectations. Call us at 800-321-4968 to get started and to learn more about our lift tables.